Shortly before her 13th birthday Laura Crane fell in love. Her family had recently moved to the Devon coast and, already a competitive swimmer and runner, Crane wanted to ride the waves that broke just metres from her front door. She entered the sea a surfing novice. She emerged having ignited a passion that would shape her life. Surfing quickly took precedence over other pursuits. Neither track or pool could compete – from then on, all that mattered was the sea. Well, double maths or riding the sun-kissed crest of a wave just a postcode away from paradise? Which would you choose? Within a year she was surfing competitively. Aged 14 she became British champion, a title she held until she left the UK surfing scene. 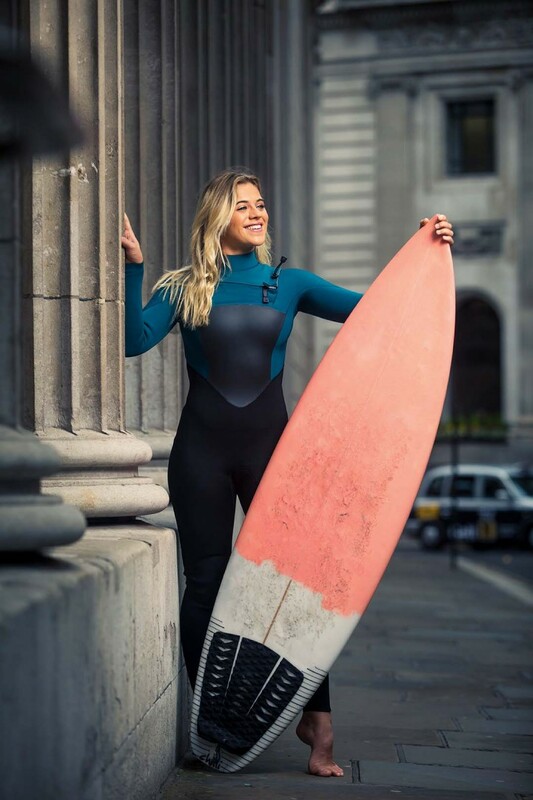 Her passion has taken her around the world: formerly a resident of Bali, she now lives in Ericeira, a Portuguese coastal town renowned for its surfing – and today she has come to London for the square mile photoshoot, surfboard and all. I’ll let the images from the shoot speak for themselves. And if you were the wit who offered us directions to the Thames – you and ten others, buddy. Despite the wetsuit, and the surfboard, and the late winter clouds (just the 1,370 miles to Ericeira), Crane is an utter champ throughout; so, in fairness, are the public, whose bon mots lack malice as well as imagination. We attract a lot of puzzled looks (fair) but fewer than you might expect, considering it’s a surfer being photographed in the middle of the City. Which just goes to prove that British sense of curiosity tends to be overridden by British commitment to minding one’s own business. 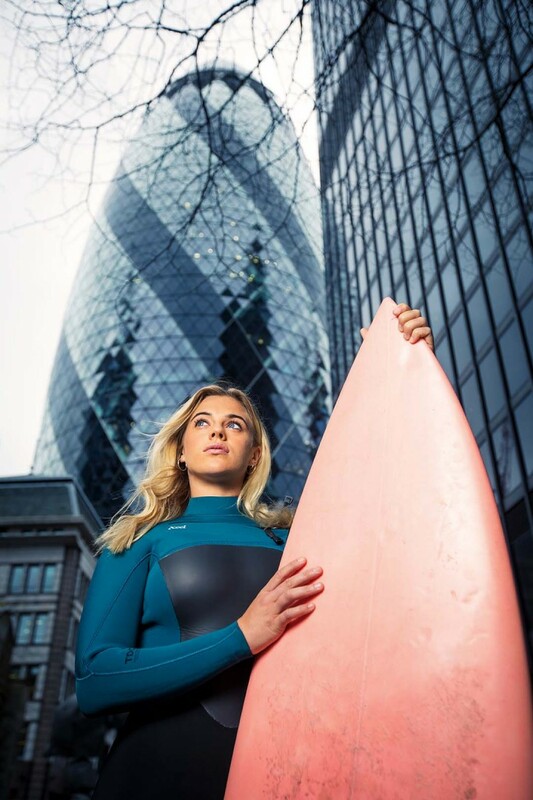 After schlepping round the Square Mile (she wore boots in transit: we’re not monsters), we retire to M Bar on Threadneedle St for the potentially quixotic attempt to discover, via interview, whether there are any downsides to being a 22-year-old professional surfer based in Portugal. The answer (spoilers): not many in terms of the lifestyle itself, but being a 22-year-old professional surfer with nearly 80,000 Instagram followers can bring its own pressures, pressures it might be hard to understand if you don’t have nearly 80,000 followers on Instagram. But first, the surfing. More than perhaps any other discipline, it is surely impossible for the non-surfer to know what it is to surf. Sure, we can imagine – as we imagine scoring the winner at Wembley, or playing Madison Square Garden, or flying – but despite the remarkable abilities of the human mind, sometimes reality is just better. Even for the observer it’s a hell of a sight, the surfboards cutting like scalpels across the face of the ocean, sharp, precise, ludicrously fragile as their riders navigate several hundred tons of water thrust way up into the sky, human matchsticks harnessing the rolling power of an entire planet. Yet already we’re on the wrong track, because skilful surfing appears effortless, whereas in fact it’s all effort, a constant adjustment of weight and posture, a non-stop calculation of a million tiny elements that change before you can even register them. Or so I imagine. How? How do you stand up? How can anyone possibly stand up? Well, you begin by falling over: no surfer – no anybody – can achieve excellence without starting from a point of explicit non-excellence. If you don’t accept this fact, you’ll never go anywhere; if you embrace it, you might go very far indeed. So the stereotype of the chilled-out surfer dude/chick isn’t exaggerated? “It’s true. It’s really true.” She describes the community as “a lot of people that have got such a broader look on things. They’re out in nature all the time. At least all of this standing around provided a solid grounding for her stints spent in front of the camera. She began as a child model for Billabong and never really stopped, even though the clients may have evolved from clothing brands to glossy magazines. And as well as professional photoshoots, there is also Instagram. She stresses that this pressure was internal rather than a product of the modelling industry. (Indeed she cheerfully recounts a recent shoot in which the photographer appeared terrified by her shortage of clothing, much to Crane’s amusement.) There can’t be many teenage girls – there can’t be many people – who could remain unaffected by the attention of thousands of strangers. You might be thrilled, you might be daunted, but you’re going to be something. It’s inspiring that somebody with so much in life is so determined to give back. Yet while it doesn’t remotely detract from the value of her message, or her personal struggles, most of her Instagram followers won’t be surfers with a sideline in modelling. “That’s another thing I want to also do,” she says instantly. “To explain to people that I have bad days too, you know. “Everybody puts the best of the best days on their Instagram. You put the best bits of everything, and everyone does it… The Kardashians or whoever, they’re always putting the best bits, cos nobody wants to show picking up their dog poo from the floor. Kim Kardashian reportedly lost 100,000 Instagram followers in April after unairbrushed paparazzi shots of her famous derriere led to accusations the official @kimkardashian feed was heavily photoshopped. This life-affirming episode aside, does Crane believe her desire for digital authenticity is spreading? “I think people are searching for real life now. I think people want to see real. Because the fake thing is getting overdone. It’s boring. Leave the world a better place than she found it?